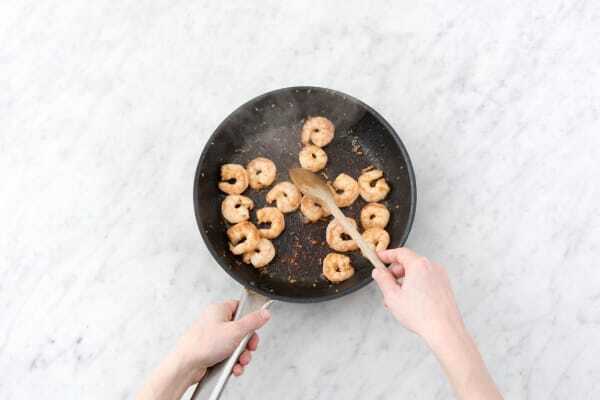 Tossing shrimp in a sweet hoisin glaze creates delicious caramelization in the pan. By stirring a bit of ginger and scallion into the rice as it boils, we’re infusing it with fragrant aromatics. These quick tricks make for a super flavorful 30-minute stir-fry! Wash and dry all produce. Preheat the oven to 400 degrees. In a small pot, bring 2 cups water and a large pinch of salt to a boil. Trim the ends of the green beans. Trim, then thinly slice the scallions, keeping the green and whites separate. Mince or grate the garlic. Peel and finely grate the ginger. Add the jasmine rice to the boiling water, cover, and reduce to a low simmer for 15-20 minutes, until tender. 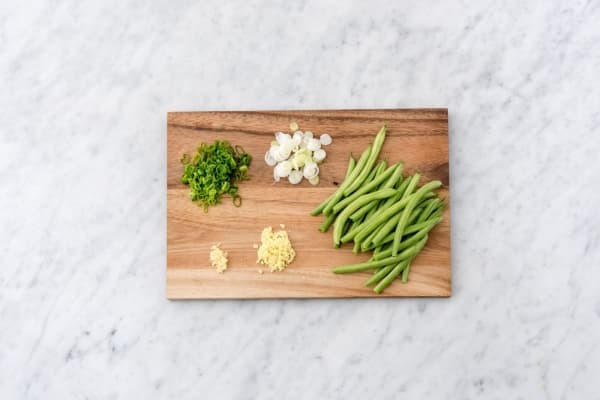 Roast the green beans: Toss the green beans on a baking sheet with a large drizzle of oil and a pinch of salt and pepper. Place in the oven for about 15 minutes, tossing halfway through cooking, until slightly crispy. 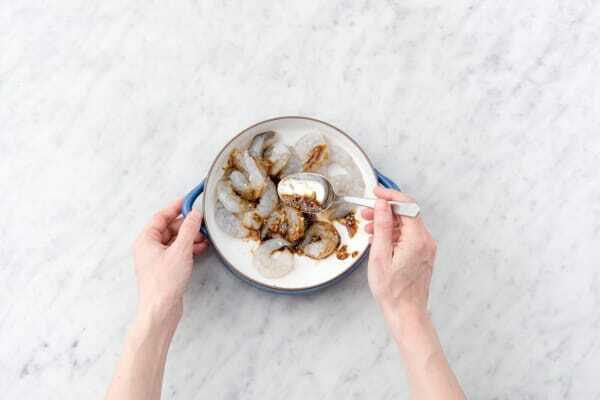 In a medium bowl, toss the shrimp, hoisin sauce, garlic, and half the ginger together until thoroughly combined. Season with salt and pepper. Roast the sesame seeds: Place the sesame seeds in a large pan over medium heat. Toss for 2-3 minutes, until fragrant and slightly golden. Remove from the pan and set aside. Heat a large drizzle of oil in the same large pan over medium heat. Add the scallion whites and remaining ginger (or less if the kids prefer it) and cook, tossing for 2-3 minutes, until soft and slightly golden. Transfer to the pot with the rice, stir to combine, and cover. 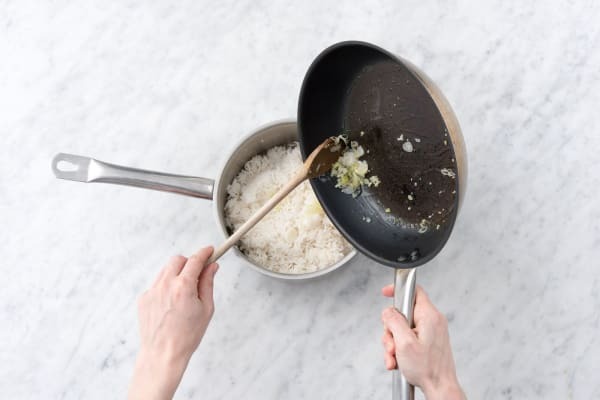 With about 4 minutes left on the rice, add the marinated shrimp and a large drizzle of oil to the same pan over high heat. Cook, tossing for 2-3 minutes, until the shrimp are opaque and slightly charred on the outside. Finish and serve: Cut the lime into wedges. 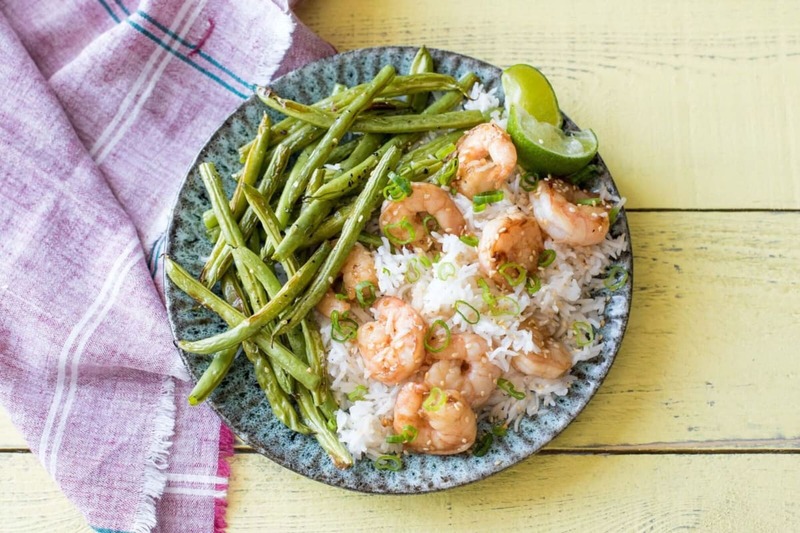 Serve the sesame shrimp on a bed of ginger-scallion rice with the crispy green beans to the side. Sprinkle with the scallion greens, sesame seeds, and serve with a lime wedge. Enjoy!